A beautiful, honest portrait of loss and deep friendship told through the story of two iconic polar bears. Gus lives in a big park in the middle of an even bigger city, and he spends his days with Ida. Ida is right there. Always. Then one sad day, Gus learns that Ida is very sick, and she isn’t going to get better. The friends help each other face the difficult news with whispers, sniffles, cuddles, and even laughs. Slowly Gus realizes that even after Ida is gone, she will still be with him—through the sounds of their city, and the memories that live in their favorite spots. Ida, Always is an exquisitely told story of two best friends—inspired by a real bear friendship—and a gentle, moving, needed reminder that loved ones lost will stay in our hearts, always. Caron Levis grew up in the city that never sleeps (a.k.a. New York City) yet confesses that even as a baby she slept through the night. Caron has an LMSW from Hunter College and an MFA in creative writing for children/YA from The New School, where she now teaches and advises. Caron never tires of visiting schools to work with kids using her books, drama, and creative writing to encourage social, emotional, and literacy skills. Things she’ll always stay awake for include great theatre, star gazing, and turtle watching. Visit Caron online at CaronLevis.com. Charles Santoso loves drawing little things in his little journal and dreaming about wondrous stories. He gathers inspiration from his childhood memories, and curiosities he discovers in his everyday travels. He has illustrated several picture books, including I Don’t Like Koala by Sean Ferrell. Charles also works as a visual development artist, creating illustrations for feature film projects. He lives and works in Sydney, Australia. You can visit him at CharlesSantoso.com. *STARRED REVIEW* "Inspired by two polar bears that lived in New York City’s Central Park Zoo several years ago, Levis (Stuck with the Blooz) takes readers on a reassuring emotional journey that explores friendship, love, and loss.... Levis’s characterization of caring, supportive friends is spot on.... The description of Ida’s passing is brief, poignant, and gentle, as is Gus’s adjustment to life without his best friend. Santoso (I Don’t Like Koala) creates gauzy backgrounds featuring the city skyline and the zoo’s greenery, and his slightly anthropomorphic bears convey a wealth of feeling through their expressive eyes, smiles, and body language." 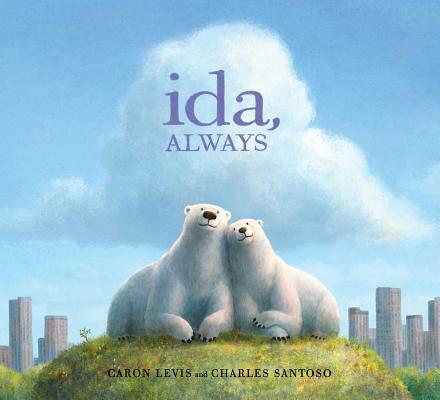 *STARRED REVIEW* "Loosely based on Gus and Ida, the polar bears who lived at the Central Park Zoo until Ida’s death in 2011 and Gus’s death in 2013, this frank yet sensitive work explores loss and affirms the power of friendship.... While the tone is gentle, Levis is honest about the turmoil and anguish of terminal illness.... The quiet, lyrical text is complemented by the soft, evocative visuals.... Santoso’s design is particularly inspired, with good use of the gutter and perspective.... Although Gus experiences real loss upon Ida’s death, the book ends on a hopeful note, emphasizing the strength of the friendship and Gus’s memories of Ida. VERDICT A tender and honest portrayal of coming to terms with death." *STARRED REVIEW* "In an honest and upfront manner, [Caron Levis] gracefully reflects the complicated emotions of not only dealing with loss afterward, but living with the dying. In Levis's soothing narrative, Ida will always be with Gus, because, as Ida told him,"You don't have to see it to feel it." The polar bears are sweetly and expressively drawn, and the sky, clouds, shadows, sunshine and rain in Australian illustrator Charles Santoso's (I Don't Like Koala) softly luminous digital paintings all beautifully mirror the story's joy and sadness." "This is a picture book about loss and grief, so it is probably not a coincidence that it is pictorially dominated by skies. Santoso paints amazing skies.There's a spectacular view of the sky on almost every page of the story.... The book is very blunt about what's happening: "one day, when her body stopped working, Ida would die." Levis writes about death and the bears' mutual devotion with surprising beauty.... But some of the most affecting passages are hardly poetic at all... the pictures are so simple they're heartbreaking." "This simple story of bereavement and friendship is made even more affecting by its richly colored, quiet illustrations.... A heartfelt and powerful depiction of loss and recovery." "This thoughtful story is a good way to introduce a discussion of death to young children.... The soft gentle illustrations perfectly complement the understated, quiet text. This would be a good addition to library collections on death and dying for children."